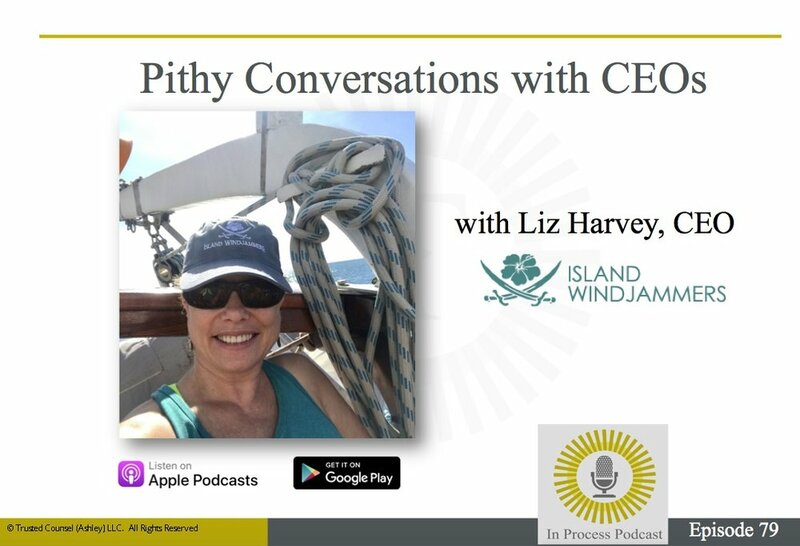 In this episode, second of a new series titled “Pithy Conversations with CEOs,” Trusted Counsel’s Evelyn Ashley and John Monahon speak to Liz Harvey, CEO of Island Windjammers. Island Windjammers provides cruises in the Eastern Caribbean to seasoned travelers, the kind who’d likely turn their back on overcrowded massive impersonal cruise lines. Liz's guests cruise on any of the three Island Windjammer’s ships; Diamant, Sagitta, or Vela, and happily spend their recreational dollars for the experience of smaller ships (10 – 26 guests). Experiences include; visits to smaller islands in the Caribbean, exploring quaint villages, and having more personal activities such as snorkeling and beach barbecues. The conversation with Trusted Counsel revolved around how Liz started the business, what she’s learned with respect to running a seasonal business, virtual management, and her sharp focus on the future. Success for Island Windjammers is all three ships averaging 80 percent or better occupancy over the course of the year. In 2017, when Caribbean tourism drastically decreased due to Hurricanes Irma and Maria, survival was difficult for Island Windjammers. Rather than throwing her hands up in the air and doing nothing, Liz and her team started a GoFundMe page. Using the small yacht, she and her team collected and sent relief items to ravished islands, and anything to help out. “Those are our friends out there too. Friends of our crew member’s families, it really hit pretty close to home,” Liz told us. When Liz is not busy managing her business virtually, you can find her at Roswell Surgery Center in Georgia. Yes, she’s still an operating room nurse who’s always willing to help, although she’s no longer working there full-time.